When you enjoy different nighttime activities, you need the gadgets that are most appropriate for them. 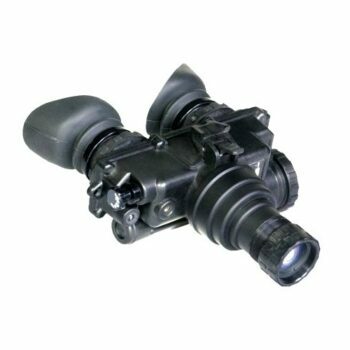 Even in terms of the best night vision, you’ll find various equipment that suits a variety of purposes. That’s why we’re here for: to help you choose among them. We’ll start by discussing the main features that influence your choice, then move on to top notch products on the market. That will help you compare and contrast their highlights according to your needs, so you can make the best choice. 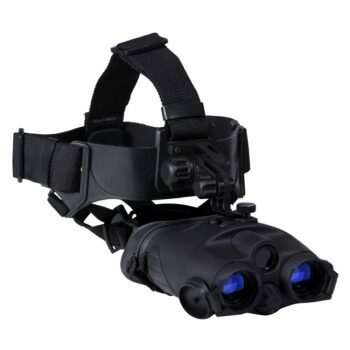 There are various features and factors that should be very well pondered before acquiring any sort of night vision. Your purpose or activity determines the type of night vision you need. Do you need such a gadget for leisure or for professional use? If you need it for professional reasons, you need to get a more specialized device. Do you need something for bird watching or nature observation? At this point, binoculars would be better because they provide better vision. Do you need a night vision gadget for hunting? Then get a monocular that allows you to use your other eye for shooting. Are you more interested in search and rescue or camping? A good pair of goggles does the trick. If you want to see further away, you’ll need a bigger magnification. However, considering these are night vision devices, you won’t see minute details past 200 yards even with the best of them. Just consider some goggles don’t have any magnification at all. On the other hand, a smaller magnification means an increased field of view. A 1x equals a more accurate depth perception too. What you really need to consider in terms of dimensions is the lens diameter. For night vision that is extremely important since the possibility of an increased light transmission allows you to see better. A crisp image is, therefore, the result of an increased lens diameter. In terms of coating, look for products that offer fully multicoated or multi coated lens. Multiple layers of coating are better for rendering a brighter image, but they do add to the overall weight. A nitrogen purged gadget with an O-seal is another feature to consider. That reduces the internal fog and minimizes the blur around your image. Also, you can check if your chosen night vision device is waterproof, fog proof and dust proof for increased resistance to the elements. If you want to use this gadget during the day, make sure that daytime mode is available. You’ll probably need to use the lens caps here, so don’t forget that or you’ll ruin your device. But you’ll possibly need other dimensions during the day, like a bigger magnification. 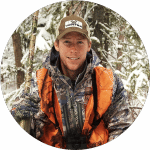 If you’re planning to use your nighttime vision when the sun’s up, make sure it has versatile dimensions for medium distance use. If you’re getting a monocular or a pair of binoculars, and you’re using them for longer periods of time, you might need a tripod so your hands don’t get tired. Also, check if your device allows for a helmet or head mount. We also like to see lens caps, fiber cleaning cloths and carrying pouches in the package. Among the extras, check if your product offers a built-in IR. The infrared LED light is what helps you see well even when it’s pitch dark. Otherwise, you might need a light source, like at least the moonlight. Low Light Level (LLL) illuminators may only work at dusk or dawn though, which might be good enough for bird watching or hunting. That said, let’s look at what the market has to offer in terms of good night vision. With such a vast array of choices at your hand, you need to research carefully. We’ve compiled 8 night vision reviews in terms of their official specs and your needs. We’ll highlight their pros and cons too, so you can make a faster comparison and hence a better decision. 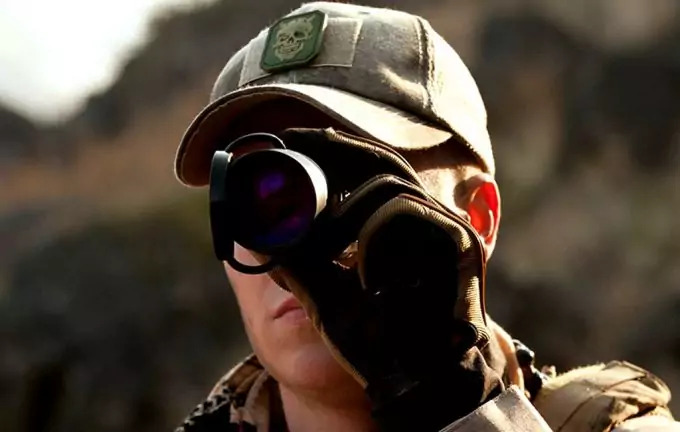 The Bestguarder WG80 Night Vision Binocular is best used for surveillance purposes because of its video and image recording capability. You’ll get good pictures too, in high definition, and at a maximum distance of 980 feet. The downside is that you’ll need to get your own SD card, though the 32 GB slot card is there. The 4x magnification is reliable for medium-long distance during the night. 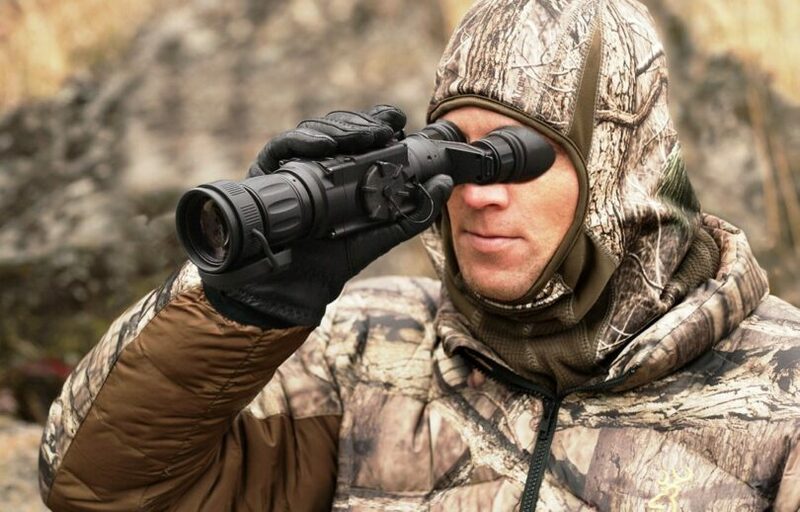 Since this binocular offers daytime use, the 4x is enough for a short-medium range. The 50 mm lens diameter is great in terms of light transmission and image brightness, while the 1-5x zoom is a definite asset. We love the 850 nm IR since this is a powerful illuminator, which helps you see in complete darkness. And even with the IR on, the lithium-ion battery has a pretty long life. However, the needed batteries aren’t included in the package either. 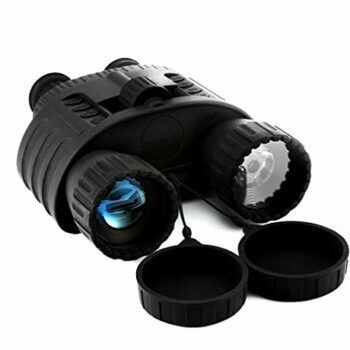 This weatherproof and overall resistant pair of binoculars does come with some significant extras, like the cleaning cloth and carrying pouch, a USB, and TV cable, as well as a neck strap. We also appreciate its time-lapse function that helps you take pictures at preset time intervals, which is great for nature observation/surveillance. Related: Since you need an SD card if you want to record images and videos, we recommend this SanDisk Ultra 32GB microSDHC. It’s easy to use, it has a long shelf life and works with other devices that have a 32 GB SD card slot. 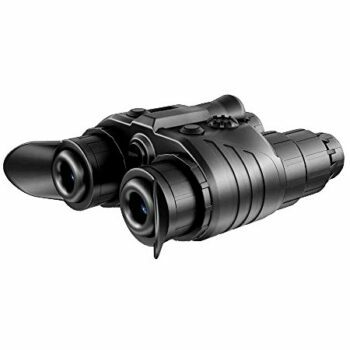 The Firefield Tracker Night Vision Binoculars is another reliable gadget for night use. You can either hold it in your hands or mount it on your head for hands-free use. And that’s a considerable help since it weighs 1.4 pounds, but the mounting can’t be adjusted fast for different users. 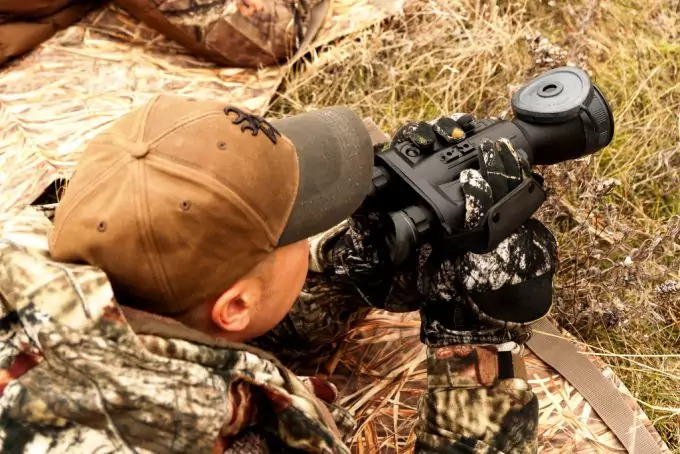 The 1x magnification offers a large field of view and exact depth perception. However, you won’t see any magnified details, but we appreciate the fully multi coated lens in terms of image brightness. The rendered images are qualitative enough, even though this is a gen 1 device, thanks to the powerful IR used. This is a pulsing sort of infrared, which means your battery life will be increased. Speaking of which, the CR-123A type has a long shelf life itself, but the downside is that it’s pretty hard to find. We love the ergonomic, rubberized construction of these goggles. The comfort and focus on user experience is obvious from the Eclipse Lens covers used too, as these are flip-ups, not caps. The dual diopter adjustment and central focusing knob are additional pluses. Related: Since you won’t find the batteries at every drugstore, it’s wise to order them in advance. The Streamlight 85177 CR123A Lithium Batteries are great, with a 10 year shelf life and a convenient and compact 12 pack. 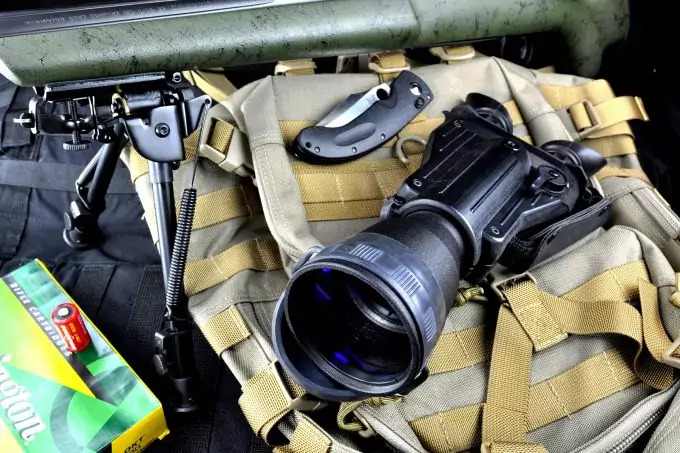 The Barska NVX100 Night Vision Monocular is a great gadget for hunting. That’s because it’s a monocular that allows excellent shots in the dark. The 3x magnification is good at a medium distance, but the field of view could be better. The 14.5 mm diameter is also quite small in terms of light transmission and image brightness. On the other hand, we appreciate the powerful 850 nm built in IR light. This infrared LED is 3 W, which tells us it’s a really performant bulb. The image and video recording capability is another plus of this monocular, and you can easily transfer the recorded pictures onto your PC. And unlike the Bestguarder WG-80, this monocular comes with its own included SD card, though this is just a 1 GB card. There are also a mini USB and AV cable included, as well as a neck strap and carry case for portability. We would have appreciated a head mount too, though. 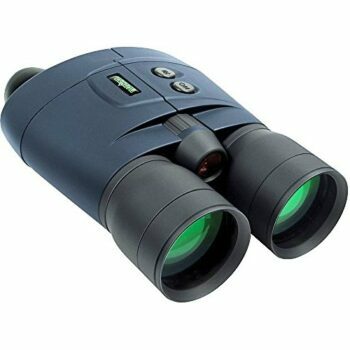 Related: If you need another conveniently priced monocular for daytime use, that’s great for nature observation or bird watching, we recommend the Wingspan Optics Explorer Monocular. 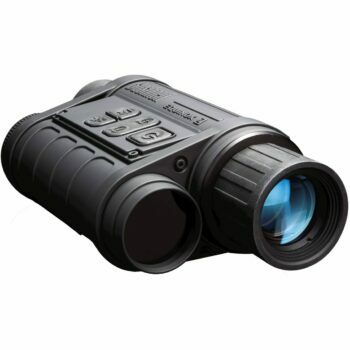 With its 12x magnification, it offers minute details at a far distance. The 50 mm lens diameter is great for image brightness, while the tripod mounting ability is great for prolonged use. 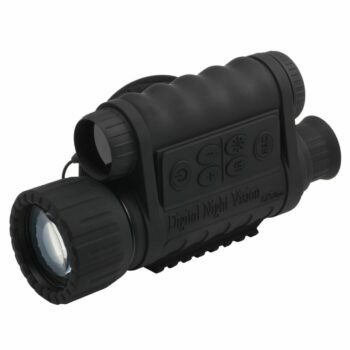 The Night Owl Pro Nexgen Night Vision Binocular is another reliable binoculars for night use. We recommend this for its awesome design, that includes a couple of electronic intensifier tubes in the stringer system. That will allow you more accurate control of its focus. The built-in infrared is very powerful, for clear images. It’s a columnated sort, so you can rely on its high quality. Though this is a gen 1 device, you’ll get a generous 5x magnification and a large 50 mm lens diameter for outstanding image brightness. However, the angular field of view is quite narrow, at just 12.5ᵒ. The adjustable interocular distance is great though, as you can center it over each eye as you need to and reduce the disadvantage of a narrow FOV. The CR-123 battery is great, albeit hard to find and not included in this package. The overall construction is another plus. The objective and lenses are all-glass. The finish is ergonomic since it’s soft rubber. The lens housings are made from molded thermoplastic, which renders them resistant to shocks. Related: Since you’ll need batteries for this pair of binoculars, we recommend the Surefire Battery 123A 3 Volt Lithium Batteries. These come in a 36 pack and have a 10 year shelf life, so you can use them for other devices too. The ATN PVS7-3 Night Vision Goggle is the most expensive product amongst all our night vision reviews, but it’s a Gen 3 device intended for professional and demanding applications. As such, it’s image intensifier tube assures you of the highest quality available today in different weather conditions. The optics are qualitative too. They’re entirely made out of glass, and they’re multicoated for amazing image clarity. The IR is another feat we’re crazy about: it’s either intermittent or continuous, plus it has a low battery indicator. 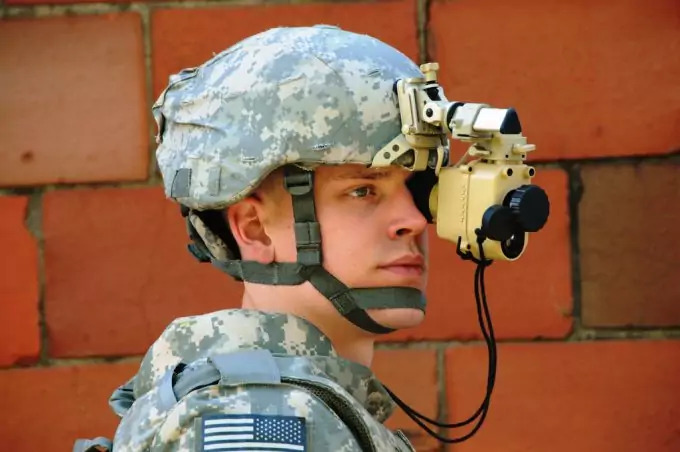 You can use this goggles in different ways: on your head, on a helmet, mounted on a tripod on hand held. You’ll even find a military head strap in the package, that’s pretty resistant. In fact, these goggles are weather and shock resistant, with a sturdy construction. The demist shield for no internal fog, along with the sacrificial filter for the objective are the features we love most. However, we also appreciate the comfortable head assembly, shoulder strap, and neck cord. The package is pretty complete too, with a soft carry case, lens cloth and caps included. Related: When you’re outdoors during the night, you need to keep your most precious gadgets at hand. That requires the use of a resistant belt pouch, like the VANTOGER Travelling Running Belt. This is waterproof, shock and puncture resistant, and has a large capacity, which is why we recommend it. The Pulsar Edge Gs Super Goggle is great for brush hunting because it has a 1x magnification and a small 20 mm lens diameter. The angular field of view is wide enough though, at 36ᵒ, all of which accounts for great depth perception. The multi coated lenses are an asset when it comes to clear rendered images, but the R-contact optical construction helps too. Though this is a gen 1 device, the CF-Super image intensifier tube does its job marvelously. And the wide five lens eyepiece is a true helper in terms of no distortion and high resolution. The included IR is very bright and powerful. It’s the variable type, but it comes with a bright source protection too. However, the visible red light can be a disadvantage for hunting. And since it only goes as far as 10 feet, you won’t be able to use it for bigger distances. The adjustable headgear is a welcome feature, but it might still feel tight if you have a wider head circumference. 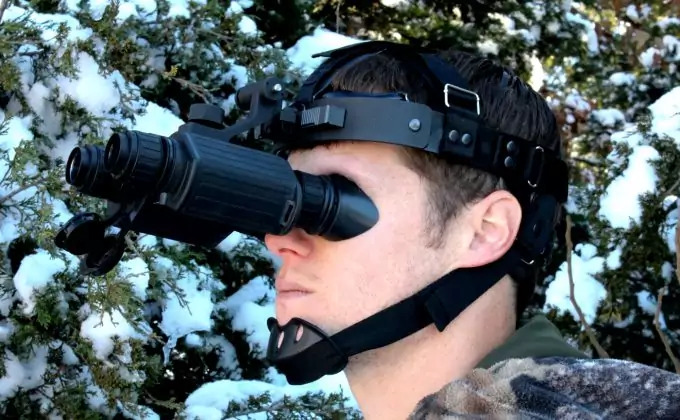 Related: If you’re looking for a pair of night vision goggles that can be adjusted for a wider head circumference, we recommend the Yukon NV 1×24 Goggles. These weigh and cost less too, but they offer a wider 24 mm lens diameter, multi coated optics, pulsing IR and an ergonomic body. The Bestguarder Digital Night Vision Monocular is great for nature observation, boating or surveillance. That’s mostly because it offers an HD image and video recording capability, with date and time stamps. However, keep in mind that this doesn’t work with Windows 8. But it’s also because of a big 6x magnification that allows you to see details at a generous distance. That, along with the 1-5x digital zoom is great for daytime use too. Even when it’s pitch black, you can also see at 1150 feet maximum range, but you can expect a narrow field of view. The 50mm lens diameter allows a large quantity of light to get through the lens, so the captured images are bright. The built-in IR is great for night use, and you get the needed USB and TV cables in the package, along with the easy-to-remove neck strap. We love the design too. This is an IPX4 rated device, which makes it water resistant, as well as dust proof. The tripod mounting capability is a definite plus, as are the 4 AA batteries required, though they aren’t included and have a short life. The whole thing is pretty hard to focus, and the laconic user manual doesn’t help with that either. The eye cups aren’t that qualitative either. Related: We recommend the Night Owl Xgen 2.1x Night Vision if you want a more inexpensive nighttime monocular. However, this one only has a 2.1x and 20 mm lens diameter, which renders it less qualitative. The Bushnell Equinox Z Night Vision Monocular is a sturdy monocular that allows you to see at varying distances. You can select the dimensions you need, between a 3x for a closer range and a 6x for the further distances. 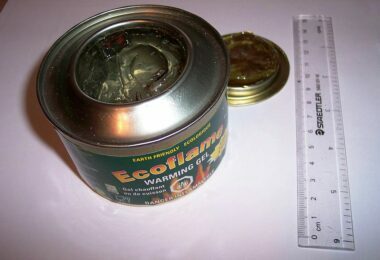 That means you can use this for different purposes, including hunting or boating. The 1-3x digital zoom is a definite asset for detailed observation, and the built in IR that reaches about 500 – 1000 feet in complete darkness is great. We also appreciate the daytime use capability, which comes with crisp colors. The multi coated objective contributes in that regard too. This might be a gen 1 device, but it does its job great. The extras include the possibility to record videos and the accessory mounting capability. However, if you mount it on a tripod, you might not be able to use the video recording, since the switch might be out of reach. Speaking of which, the design is also a bit lacking when it comes to the on/off switch being located too close to the other buttons. That means you might accidentally press another button, or close the monocular by mistake. The eye piece is also not friendly for farsighted people. According to your purpose, you can either get a less expensive item like the Barska NVX100, which is great for fun. Or you can get the more expensive ATN PVS7-3, for professional use. 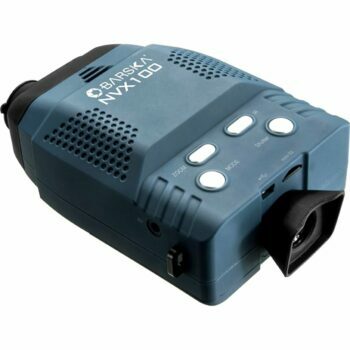 You’ve read night vision reviews for gadgets with recording capability, with powerful infrared illuminators, with daytime use and different dimensions. So the choice is ultimately yours. Tell us what you’ll get and why. What are you planning to use this gadget for? What would you recommend other users? The comments are right below.